Good winter helmet? 🥶 Experience with TSG Pass helmet in winter? So I'm finally looking for a winter helmet and wondered what everyone's experiences with this topic are. A winter-specific helmet. I'm happy with my Fox Proframe, which is as light and airy as a full-face helmet can be. Now I need something for cold temperatures. Anything from below 15°C (which can get quite cold with the wind from riding) to 5 hour rides in sweet icy negative degrees Celsius. Visor against the wind (one should be able to open it, but I think they all do that). Clear, if a sun visor extra option is available as an extra that would be even better. Warm, and not too much ventilation so that one doesn't overheat, but also doesn't cool out, and so the wind doesn't howl through it. I want to wear a jacket and a scarf, ideally for everything above the helmet should do the trick. So I'd be happy to hear your experiences and recommendations for such a winter helmet. What you use, what works and what doesn't, what to look for, etc. I am eyeing the TSG Pass (see picture), it just looks so nice and seems to have everything (on paper). I especially like the different inserts that allow to fine-tune the helmet fit. Can anyone tell how warm it is and if it is suitable for winter riding? And if there are similar alternatives, I'm happy to hear about them. Currently I am using a simple skiing helmet (and glases) for my winter rides. It is really warm and comfy, but it has no chinguard so no crazy fast riding for me with it. 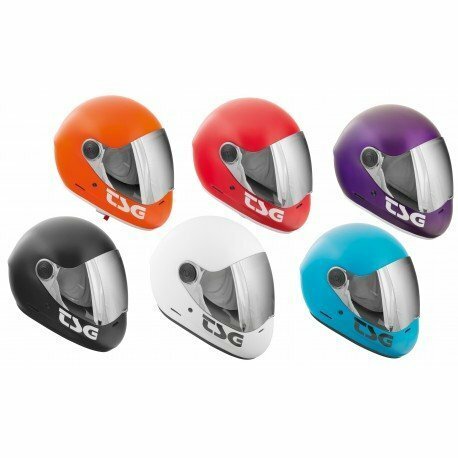 The TSG Pass Pro helmets are very lightweight at 940 grams. For me, the combination of lightweight, great protection, and comfort are my main priorities. I am somewhat limited in the helmets I can wear due to my XXL helmet size. So, for me TSG is a no go. However, I think the Pass Pro is a great helmet; especially in carbon form, but protection limited in the way bicycle helmets are compared to motorcycle helmets. I currently wear a BMX/DH: the Bell Full 9 (BF9) bicycle helmet. I love it, but I think personally I will gravitate back towards motorcycle helmets for three reasons: better protection than bicycle helmets, better technology has substantially slimmed the historic compromises between weight and protection; monstrous diver's helmets are no longer needed for great protection, and wider field of vision versions comparable to bike helmets available all without protection compromises. I am currently eyeballing the Nexx XR2. Expensive? Yes ($600). At under 2.6 lbs (L) it is the lightest full face motorcycle helmet available on the market. My BF9 weighs in at 2.4 lbs (L). I realize that a $600 helmet might not be considered a practical choice for many, but I also ride motorcycles. So, for me the helmet would theoretically be a dual purpose wig. I love the TSG, though; especially, the full face Pass Pro. I wish they came in my size. Didn't realize there is a Pass and Pass Pro. The differences seem not too big. Still wondering how warm either of them is. You think it would make a difference with a EUC? I assume a MTB/Downhill/Enduro helmet (like my Proframe) should be enough? I am currently eyeballing the Nexx XR2﻿. Expensive? Yes ($600). Haha, too steep for me. Maybe a motorcycle helmet is indeed better for cold weather? Built for higher speeds = more wind expected = more thermal insulation? Depends. There is of course price to consider . Many will feel that the extra protection is overkill. I am one of those people. I don't think it's necessary to have motorcycle level protection for EUCs; hence, the reason that I wear a BF9. On the other hand, it's sort of difficult to argue that extra protection for one's brain is overkill. However, if technology is neutralizing the contradiction between weight and protection, I figure why not go for the most protection possible. On the other hand, it still costs $600+ bucks to mitigate the compromise 😧. This is simply not going be a reasonable consideration for most. I bought my 18L because I didn't think MSX level range was necessary. Maybe so, but now that I have it in my 18XL I wonder why anyone would bother with a lesser powered wheel. It's one of those; "you can't miss what you don't have" sort of phenomena. Once you can affordably buy motorcycle helmet protection without sacrificing the weight of a bicycle helmet then why not? they are warmer in the winter with better protection than bike helmets. It doesn’t matter what thermal properties your helmet does or doesn’t have, or how many vents it has. If you wear a balaclava with wind stopper (GORE WINDSTOPPER) then it will stop the wind chill period and keep you warm with the visor down. Helmets are never insulated, they’re designed to flow air, especially ones with visors. No air flow = fogged up visor. I bought the Pass Pro specifically for cooler weather. It's much warmer in winter than the vented BMX helmets like the Bell Supers (I also own a 3R). The carbon-fibre Shoot is sleek and hi-vis, and gets lots of compliments, but is hard to find and may be (soon) discontinued. It is downhill rated for both skating and cycling (see my earlier post here), and it has protected my head perfectly during two recent full faceplants such that I felt nothing, despite the close fit. Like @Darrell Wesh has stated. I am rather satisfied with the warmth I have been able to maintain with my BF9 and a balaclava. I have no fogging issues because I have no visor to fog. Even when I did I rode with it open most of the time; even on my motorcycle when cruising around my city. The main issue with this method is riding in the rain; which I tend not to do on my EUC, and didn't do on my Busa unless I had to. I occasionally wear this fake beard. I'm sure I look nuts. I tested mine this Sunday when going shopping at about 5-6 C temp. I were a bit surprised how cold it felt compared to my MC helmet (LS2 FF399 EU). When I bought mine it was supplied in Grey only. The good thing is it is very thin yet warm, is it is easy to store in a pocket until you need it. I'm distracted by other stuff at the moment, but soon-ish will have more time for this winter helmet thing. Looks like the TSG Pass isn't what I need. And although the cap/balaclava combination seems the best thing to do in general, I'm trying to get away just with a helmet because that's easier and quicker, and also less interference with my glasses (I tried a regular cap under my helmet and it just didn't work). So some good motocross helmet (or similar) will probably be what I'll be looking for soon. I bought the cheaper Icaro Skyrunner helmet that superficially resembles TSG Pass. I only got to use it a few times in the fall, but as is, besides being uncomfortable it’s unusable because of fogging. Liquid treatments didn’t help much, as my whole mouth area was quickly sogging wet. Even without directly breathing to the visor, if the moist air doesn’t get to escape, I don’t think anything will stop the fogging. While there must be great differences in helmets regarding warmth, I wouldn’t dream of riding without a balaclava or other kind of hood in the winter. The Skyrunner of course prevents direct wind from hitting me, but the air that circulates is still cold as duck. And again, no air circulation = fog. I plan to try and modify the helmet for proper airflow to the visor before the snows melt. I hope I get the fogging down to a manageable levels. Look up a system called pinlock. Your helmet might be prepared for it or not. But as I understand it, it can be added to most visors. My helmet came with it, and it works 99.9% when it doesn't work, nothing else would help either. Thanks, I've heard about it. My helmet is not prepared for one, but that wouldn't be an issue for me. I still suspect that without proper airflow even the Pinlock wouldn't work, so I will keep the airflow as the first step of the possible solution. I use this helmet in the Winter here in NYC, and it does really help on keeping wind off your face. I also wear a helmet skull cap for a little extra warmth.. Im very happy with it as the Winter winds off the Hudson river are pretty severe and really make my eyes tear. On the negative side, the visor does distort your vision a bit and takes a bit to adjust too. 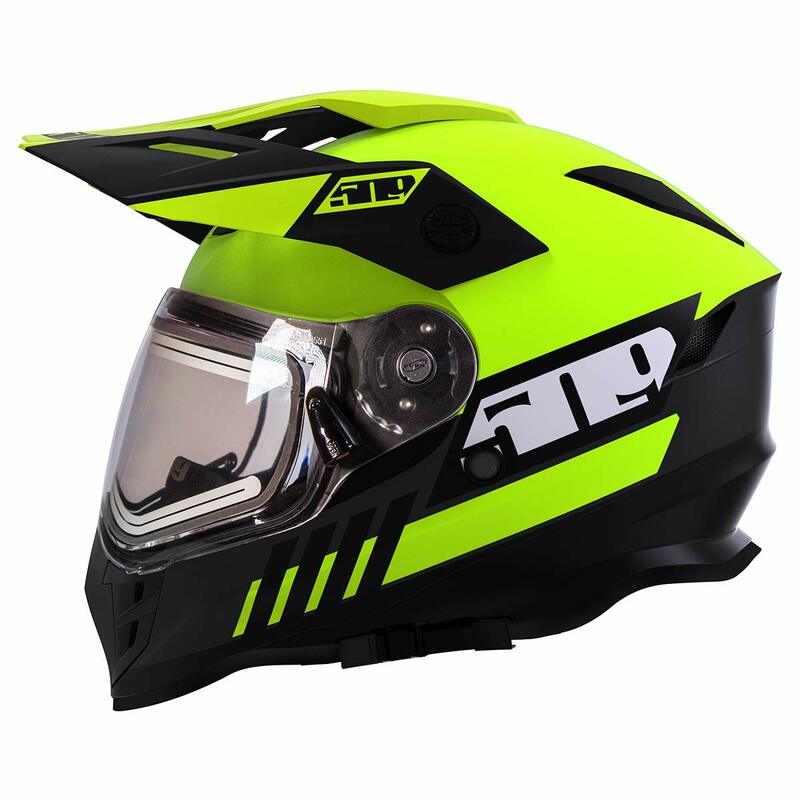 Its a great helmet, so much lighter then a moto helmet! I don't bother with the coldness but the wind that makes me feel cooler. that kind of helmet seems a good way to protect us.